The sheet from the large format Cyprian in Pepys collection at Magdelene College, Cambridge is described by Pepys as a ‘frontispiece'. It is listed as no. 201 in Catalogue of the Pepys Library, Vol. III Prints and Drawings (1980). This Special Collections' copy shows a glade in a wood, with soldiers and civilians; in the foreground St Cyprian stands blindfolded with hands in prayer; behind, a warrior prepares to strike him with a sword; above, Fame, in an oval ray of light, extends a laurel wreath.’ Drawn by Wilhelm Sonmans, the image was engraved by Michael Burghers (c.1647–1727), a Dutch artist who lived in England. 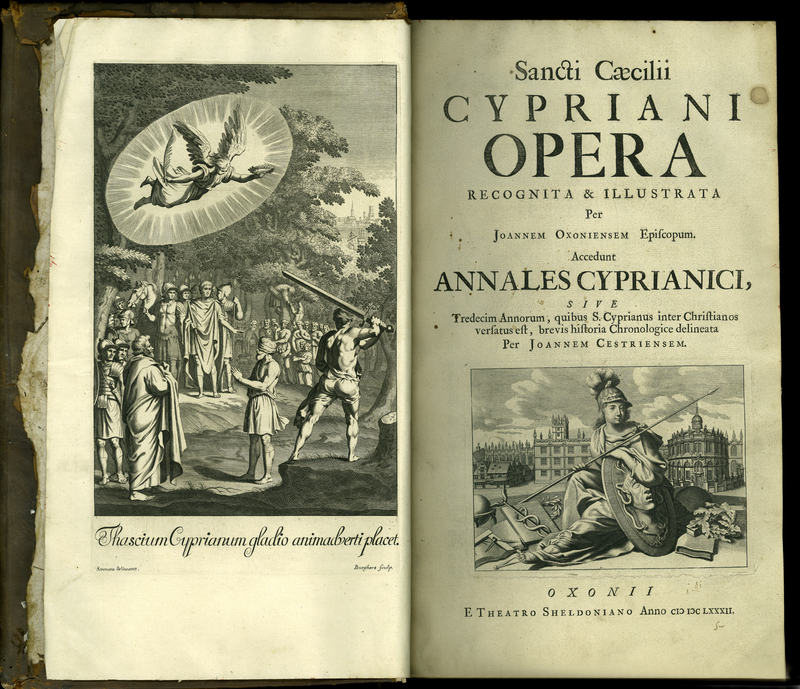 Cyprian, “Opera,” ourheritage.ac.nz | OUR Heritage, accessed April 20, 2019, http://ourheritage.ac.nz/items/show/10673.